Back in May I realized that Peter Drucker’s Managing Oneself was a cornerstone piece of writing that I need to reread annually. Its simplicity of language belies a depth of clarity and analysis about what it takes to understand oneself and, from that strong foundation of self-knowledge, build a successful personal and professional life. I’m grateful to my friend and colleague Ankur Shah for sending it to me. I found this perplexing because I honestly had no idea if I was a reader or a listener. I didn’t find school torture at all, I read like crazy, so it seemed like I had to be a reader. But the more I sat with that answer the less right it felt. My best insights come by talking things through with people. It’s only through hands-on, digging in conversations that things become real to me, that I can imagine how a solution will interact with the real world – what will and won’t work, and what’s holding something back. I’m a talker/listener. If I’m a listener and a talker who loves reading, and if I read to push my thinking, then I have to do something about reading differently. It occurred to me to make my reading a bit more like blogging, by forcing myself to process information by capturing it and writing it down. My parameters were to make the notes as visual as possible, to keep it to a page, and to focus on big concepts. I had my first go at this for another “must read and reread piece” last week – The Theory Behind the Practice: A Brief Introduction to the Adaptive Leadership Framework by Heifitz, Grashow and Linsky. The little drawings of people and all the visuals help a lot. For example the person holding the flag is the “leit,” (source of the word “leadership”) who went out ahead of the army carrying the flag. He was often killed. Kind of impossible to forget the heat you take as a leader with that little drawing floating around in my head. 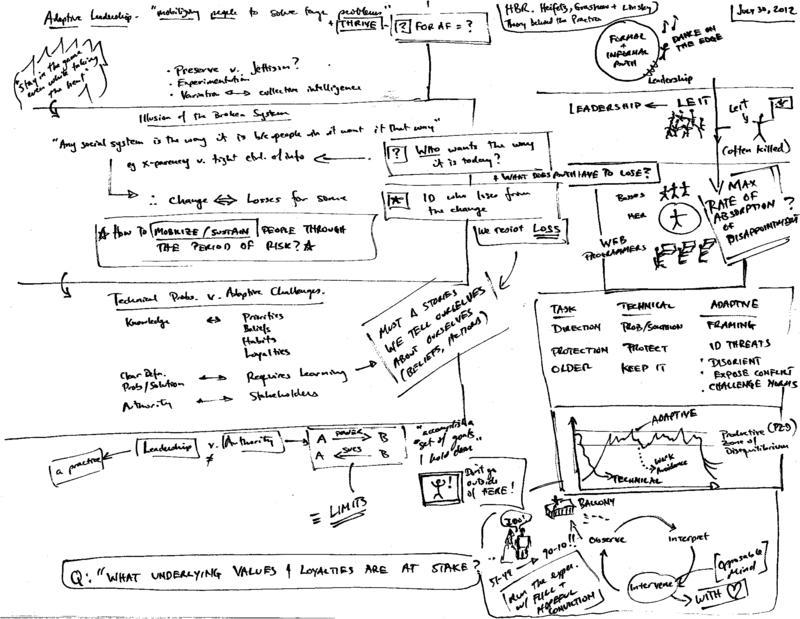 Creating these notes was easy enough to do with a 31 page HBR article. I suspect for a 250 page book it will take more doing, but I’m going to give it a go, because if I can’t boil it down what are the chance that it will affect my actions for more than a month or so? What about you? Do you know how you learn? Once you’ve figured it out, what do you do differently? I feel relieved to read this post. I have always felt myself chatty & wondered why… sigh… Why do smarty pants pedigreed education peeps never highlight this style? Another epiphany over 50 for me & the reason why I always read your blog… Thank U! Excellent post and an important subject. Related is knowing how the brain works and recognizing that a writer also has that awareness and writes accordingly. From the stand point of learning a well written piece enters and sticks with ease; a poorly written piece has to forced in and won’t stick without a lot of internal re-organization – which is too much work. I’ve found these useful in both reflecting on my own learning, and in planning training or facilitated activities, they can also be handy in meetings to help figure out how people are dealing with problems differently. Like all such models, there are critiques around which suggest that there isn’t anything to them. What excited me about your post was your aim to ‘make my reading a bit more like blogging’ and your use of visual notes. I find such visual notes really helpful. I don’t find my memory good, but I can often visualise where on a page I read something useful. Which is why I love working with graphics, I have been trained by the excellent Vanessa Randle and Penny Pullan of Graphics Made Easy (http://graphicsmadeeasy.co.uk/) and am currently taking advantage of Emily Wilkinson’s skills in visual representation through coaching sessions in which she is creating visual records of what I share (more about Emily here: http://www.mindfulmaps.com/about-mindful-maps/community/). It was just brilliant when, near the end of our first session, she asked “so where are you now in this?” and asked me to write or draw on the fantastic visualisation she had made with me. That was so much more helpful to me than a simple discussion, where I find myself caught up in words and forgetting what has been said 15 minutes ago. Also something else resonated for me in what you said, as I suddenly realised on Saturday that I might be a writer – some sort of social writer, as I much prefer writing things in response to other people’s blogs (as I’m doing now) or writing blog posts than other sorts of writing. I’ve spent years describing myself as a facilitator, project manager and other such things, but never a writer – it feels interesting and useful. So just as you are making your reading a bit more like blogging, I’d like to reframe what I’ve considered to be just messing around reading and commenting on blogs in to something creative and reflective and that I learn from … writing! Thank you, you’ve helped me to think about whether I learn best by writing. > If I’m a listener and a talker who loves reading, and if I read to push my thinking, then I have to do something about reading differently. I, too, have been grappling with this and have taken to [sketchnoting](http://www.schrockguide.net/sketchnoting.html) and mind-mapping. After reading Managing Oneself, I re-read it & made a mind-map for it just to test the waters and I have already found that it’s helped me retain and make connections I didn’t make in the first reading.